The Acton Field Campsite is the perfect place for coastal camping in Dorset and is situated just 3 miles away from the beaches of Swanage. Acton Field Campsite is one of Dorset’s dog friendly campsites where guests can experience the breath taking views of Swanage Bay from the Jurassic coast camping sites grassy pitches and enjoy local walks on the scenic cliff tops. This camping site near Swanage, is open from Easter until the end of October for members of Natural England approved clubs. It is also open to the general public for May Bank Holiday weekends, Spring Bank Holiday week & from 2nd week of July - end of August. Swanage campsites are ideally situated for exploring the Dorset coastline, for Swanage festival camping & enjoying lots of Swanage events and local attractions, Acton Field Campsite offers traditional family camping, with visits from a local mobile grocery van, a choice of pitches on the open plan grass areas and a toilet block with metered hot showers. If you are looking for friendly Studland campsites or somewhere to go camping in the Purbecks, contact the team at Acton Field Campsite, Isle of Purbeck. Reviews can be viewed on UK Campsite, currently rated as 9/10. 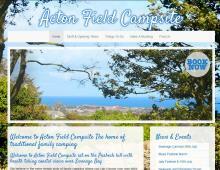 Acton Field Campsite look forward to welcoming you soon for some of the best camping near Swanage!